You may already know that Exports from Georgia contribute between $35-40 billion to our state economy each year. But have you ever wondered -- What do these Georgia products look like? This blog article and attached video is an effort to answer that question. 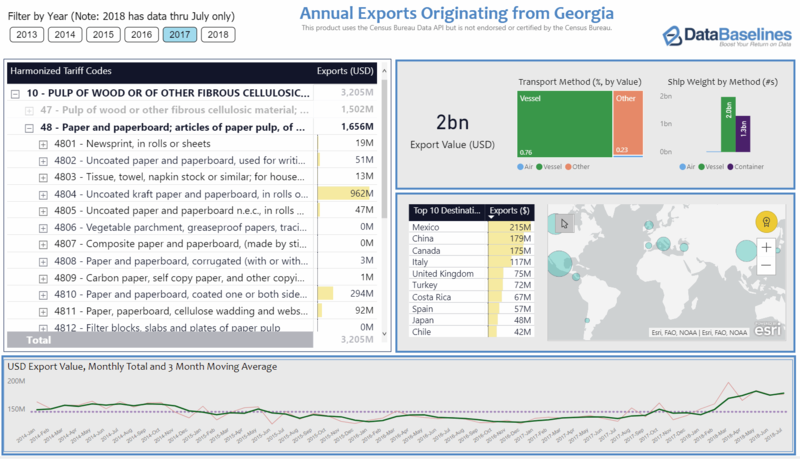 It uses a free tool from Microsoft called Power BI to slice and dice the detailed monthly export data that is available from the US Census. What Does the Power BI Tool Show? I've previously retrieved this Census data for 2013-2018 and ended up with a 2.4 million row data set in SQL Server. While it is all well and good to have the raw data - the trick is putting that data in a format end users can easily navigate and learn from. On this score, PowerBI delivers. Monthly sales trends from 2014-2018. In the demonstration you'll see that exports are classified using the Harmonized System. This is an internationally agreed-to taxonomy for naming merchandise and commodities. It is hierarchical starting from 22 "sections" and then proceeding to increasingly more specific detail. The data presented here includes section, 2-digit, 4-digit and 6-digit classifications. For more explanation of these codes, you may find this link useful. Data is limited to transactions in which Georgia is the "Origin of Movement." In other words -- only merchandise that starts it's journey in Georgia is reported here. There is a more detailed explanation from the Census on this topic. The port of Savannah and Atlanta Hartsfield airport are two assets that help our Georgia export-economy. In similar fashion, data and tools like Power BI can be an asset for your company. As shown here, PowerBI makes digging into a large data set more informative and productive. Please call or email if we can help you harness any of these Microsoft data tools.